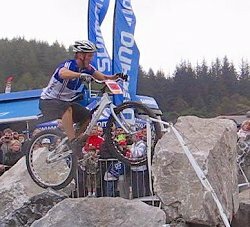 This technique is the most useful in biketrials, and works even if the bike is not positioned horizontally or if you are in a rough terrain. At least the back wheel should be positioned on top of some edge, a short flat, or a down wedge (but not in a pot hole). A pure pedal hop can bring your rear wheel forward, exactly where your front wheel was (or even further). Or you can use a kick in your good pedal to boost a static hop. 1° From the crouching position, push on your arms to bounce the front wheel up before you shift your weight forward. 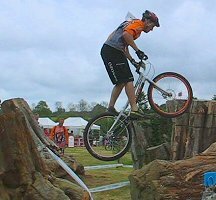 2° Follow up your extension with a very brief pedal kick, while pulling on the bars to lift the bike like in the static hop. 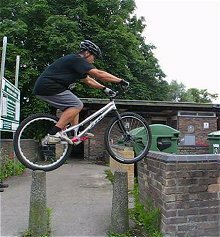 3° Once in the air, pull up the bike forward in front of you, to land your rear wheel in front of you, or any target landing spot. With the front wheel lifted. With the front wheel lower. 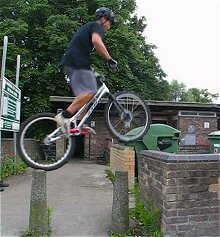 This is not a pure pedal hop in the sense that, with the rear wheel in uneven terrain, if you tried to pull a classic pedal hop, the back wheel would not be able to roll smoothly like on a flat surface, and instead of rolling forward, you would be sent over the bars (the rear wheel being stuck). 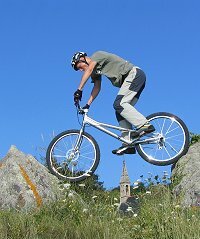 By first lifting the bike in a static hop, you can then kick briefly in the pedals to boost the impulse forward (without all your weight and the bike sticking the rear wheel to the ground, especially if the rear wheel is stuck on a slope). 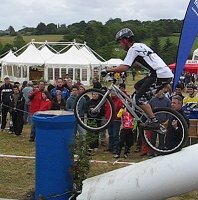 With the front wheel lifted onto an edge, you have to use a lot more your body movement, first taking support with the arms for the static hop to throw your shoulders forward, then boosting the move with a pedal kick. If the front wheel is lower, you must do a quick push up to unlock the front wheel from its lower position and kick in the driving pedal, either when reaching the horizontal or when you are leaning enough backward to make sure the pedal kick won't throw you over the bars. This combination of a pedal hop with a static hop can be applied to various degrees, up to the pure static hop (no pedal kick, and lifting the bike with the arms) or up to a pure pedal hop with all the impulse given on the pedals (no push-up on the handlebars). 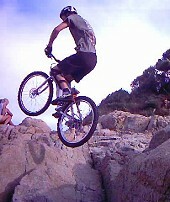 It all depends of the initial position of the bike, and the grip you can expect from the rear wheel. 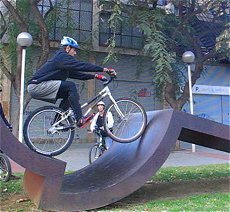 If there is little grip or if the rear wheel is stuck in a hole, it's better to pull a static hop, but if there is a good grip or the rear tyre is on a flat surface, you can pull a good pedal kick. 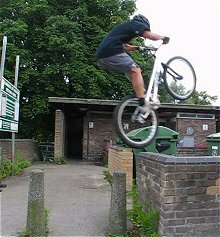 As a rule of thumb, when the bike is rather horizontal and the rear wheel on a flat, then use more the pedal kick (because the distance is difficult to get just pulling with the arms), but if the bike is really vertical then you don't have much choice but only to pull a static hop. 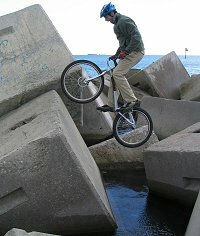 If your wheels are on sharp edges like rails, make sure that the rear hub is right above the edge, or slightly forward. So that when you kick off, you can roll off the edge neatly. 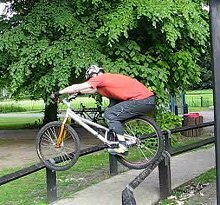 If the rear wheel is too much in a slope or off centered from the edge, compensate the drop by pulling up on the bars when you kick. That's starting the wheel transfer from the most awkward positions, and with little margin for error. 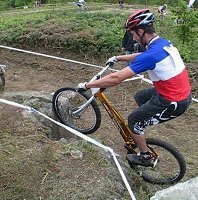 The more the front wheel is lifted, the more difficult it is to give the right pedal-kick impulse, and the more you have to rely on body movement in an upward impulse, without being able to push up on the front wheel (it is against the obstacle, not on top of it). Check out these perfect moves.